Service charge dispute resolution system is unnecessarily complex and unpredictable, although it can appear otherwise on the surface. We help with all charge disputes issues, including how to deal with landlords, superior landlords and managing agents; negotiating disputes; and resolving disputes. Whether representation is essential or to act in person. If you wish to take the matter to the Tribunal, we recommend you do as much research as you can first. For in-depth information on how key leasehold dispute issues are dealt with by the Tribunal, and key issues the self-represented people (litigants in person) face in Tribunals and courts, see a recent paper: UNREPRESENTED LITIGANTS IN MODERN COURTS – ORDEAL BY COMBAT. The Tribunals have in almost all case, ABSOLUTE POWERS (as they consider just and equitable in the circumstances, on whether to grant a s20C Order under Landlord and Tenant Act 1985) against the TENANTS / LEASEHOLDERS, but SEVERELY LIMITED costs powers against the LANDLORDS (e.g. for ‘wasted costs’ and ‘for unreasonably bringing, defending or conducting proceedings’ (see Tribunal Procedure Rules 2013, r 13; and the Tribunals, Courts and Enforcement Act 2007, s29). This is because, almost all leases (of large landlords) contain a clause covering legal costs. This means that, if the Tribunal does not grant a s20c order, tenants have to pay landlords’ costs arising from the disputes. The binding law (e.g. Nicholls LJ, Farquharson LJ and Lloyd LJ) states that, where no order as to costs has been made (e.g. granting to landlords, or tenants legal costs), allowing landlords to recover these costs through the service charge is ‘indeed a case of seeking to get through the back door what has been refused at the front’ (Holding and Management Ltd v Property Holding and Investment Trust 1990, at 948). Judge Sonya O’Sullivan allowed the Tenants to recover application costs from the Landlords (around £500). BUT denied the Tenants the s20C Order, allowing the Landlords to recover their legal costs (amounting to over £50,000) from the Tenants. If the Tribunal could rule against the Tenants in this case (with enormous evidence was against the Landlords) – leading to them having to pay Landlords’ cost – it will be difficult to find a case when the Tribunal would not do that (if same Tribunal / judges). This is common and is supported by the fact that there is not rule requiring the Tribunal (First Tier) to follow precedent. In the above case, the tribunal did not for example follow decision of the Court of Appeal or even principles well-established for centuries such as interpretation of contracts as to the natural meaning of the words. The lease stated that the Service Charge was to be collected monthly (clear wording) – the Tribunal held that Landlords could recover annually half it, even though they were concealing this from Tenants – telling them it was a one off issue due to unexpected costs. If you do not include all the documents landlords send you in the bundles (and print many copies – e.g. 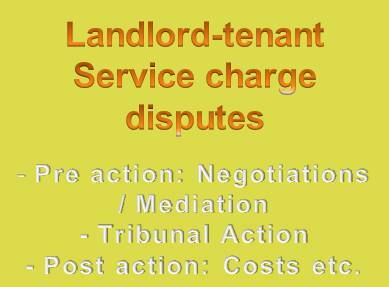 4 for the Tribunal), it is likely the Tribunal will act against you on application from Landlords (as in the case above). Such tactics can cause real damage to your case, especially if you do not know the law well, and many other factors (e.g. biases, accent etc).